In the near-future, the world order has deteriorated after America’s exhaustion from endless foreign wars causes her to pull back within her borders. Her enemies and allies alike pursue their own interests, grabbing resources, erecting trade barriers, and launching opportunistic wars. The American Century is a distant memory. Sheriff Rick Johnson thinks he’s left behind the problems of the greater world, retiring from the Marines to become the sheriff of the little town of Resurrection, Colorado. His relationship with Dahlia, his childhood friend’s widow, has given him new purpose, along with the responsibility of being a father-figure to her young son. Life isn’t perfect, but it’s better than he ever expected it would be after seeing the horrors of war. 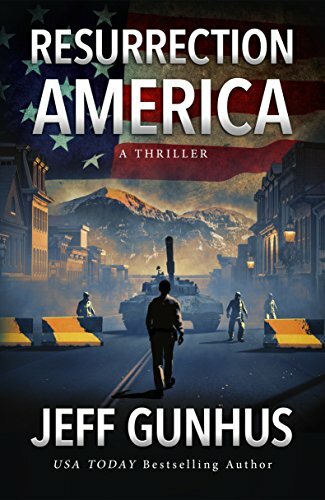 But when helicopters and armored vehicles filled with soldiers in hazmat suits unexepctedly quarantine the town, Sheriff Rick Johnson feels like the nightmares of the outside world have followed him home. While the town follows martial law, Rick isn’t buying the official version of events from the military that a virus has been released into the air. As he investigates, the cover story unravels and he discovers the military’s presence and the salvation they offer isn’t what it seems. Soon he and his ex-flame, scientist Cassie Baker, are entangled in a plot so evil that it could only be bourn from the absolute extremes of nationalism and madness. There are men in Resurrection who are willing to do anything to see America restored to her former greatness, even if the rest of the world must be destroyed to make it happen. But Rick Johnson is a man willing to do anything to protect the people he loves. And he’s a force to be reckoned with. Click here or type in http://geni.us/102417 into your web browser to pick up your copy of Resurrection America in the Amazon Kindle store. After his experience with his son, he is passionate about helping parents reach young reluctant readers and is active in child literacy issues. As a father of five, he leads an active life in Maryland with his wife Nicole by trying to constantly keep up with their kids. In rare moments of quiet, he can be found in the back of the City Dock Cafe in Annapolis working on his next novel. 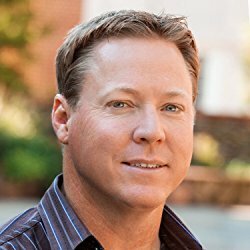 You can visit Jeff’s Amazon author page if you click here or type in http://geni.us/jeffgunhus into your web browser.